Today’s 31 Days of Pink manicure with essie cosmetics features a white triangle design that reminds us of a spine. 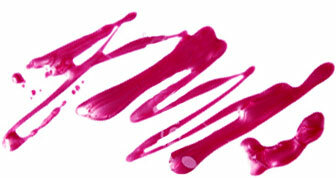 To create this look, start by painting your nails with two coats of a bright pink polish. We use essie polish in Forget Me Nots. Then, we took a thin, sturdy paintbrush and dipped it into white polish. Finally, we carefully drew tiny triangles on top of one another from the base to the tip of the nail.